When you buy a new CPU, it usually includes a Stock Heat sink* (Scroll down for note) which has a thermal pad (usually gray or tan) on it. 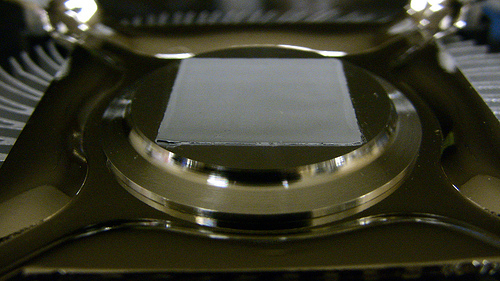 Arctic Silver is a higher quality alternative to a thermal pad so you need to remove the thermal pad. 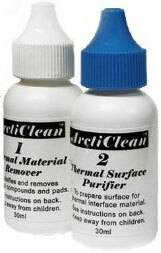 When removing the thermal pad, remember to use Isopropyl Alcohol (90% Alcohol or higher) or preferably something like ArctiClean which is much more efficient at removing thermal compound/pads/grease/gunk/etc. You are supposed to use a lint-free cloth so I typically use an old sunglass cleaning wipe that I got with my sunglasses (tissue or toilet paper would be considered lint-full). REMEMBER: You MUST remove the thermal pad prior to applying any thermal compound! 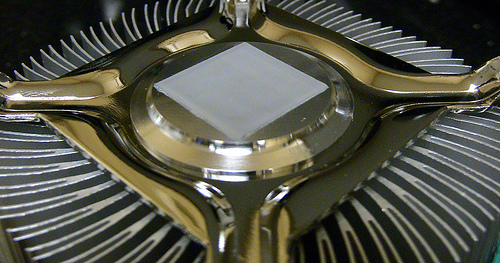 *Stock Heat-sink: The heat-sink that comes with your CPU is supposed to provide “Adequate” cooling for your processor. Studies show that computers that are kept cooler tend to perform better and last longer. My suggestion would be to replace the stock heat-sink with a more efficient after-market heat-sink. Even though I build Computers & Servers for a living, I am not psychic and I don’t know the specifics about your computer, so if you would like a heat-sink recommendation, leave me a post and include your computer specs. This entry was posted	on Monday, January 15th, 2007 at 4:51 am	and is filed under Computer, Hardware, How to. You can follow any responses to this entry through the RSS 2.0 feed. You can leave a response, or trackback from your own site. I have an alienware m5550. My idle temp. is around 80 degrees celcius. They told me they are sending a replacement heasink for some reason. I am buying arctic silver 5. Should I get a new heatsink? If so, what kind?